Tennis elbow and elbow pain is often very painful making gripping or lifting heavy objects near impossible. Stabbing sharp pain on the outside of the elbow when gripping something or lifting something heavy is often the symptom of tennis elbow or lateral epicondylitis as it is known. Pain on the inside of the elbow is commonly referred to as golfers elbow. Many people struggle to treat this common condition which can affect anyone. At Atlas Pain Relief Centre in Tamworth town centre the experienced osteopaths, physiotherapists and acupuncture practitioners have great success with tennis elbow pain. Treatments can improve function of the elbow and remove symptoms of pain. Shockwave treatment for Tennis Elbow has now been introduced as a frontline treatment option when traditional treatments are struggling. Chronic stubborn conditions respond well to shockwave therapy. Pain in the elbow can affect anyone, often it is found in middle age and onwards and if left untreated will become chronic. 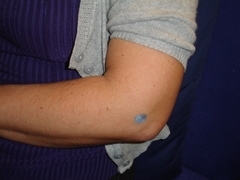 Symptoms can be severe with stabbing pain in the elbow when using the hand or wrist. Gp’s will sometimes offer a steroid injection into the area of pain which often can help but many cases do not respond to this. Rest eases the pain which returns when you use the affected limb again. Medication will ease the symptoms but not affect a cure. Tamworth physiotherapist John Williams has a Tennis Elbow treatment regime which appears to work well and restores pain free normal function again. The answer is to visit Atlas Pain Relief Centre and hopefully have your symptoms diagnosed. Treatment can then be suggested to treat the symptoms and the cause. The Tamworth osteopaths and acupuncture practitioners treat tennis elbow on a regular basis and have given many people the pain free use of their arm again.